The first research axis is dedicated to the design of novel pattern mining methods. Pattern mining is one of the most important approaches to discover novel knowledge in data, and one of our strongest areas of expertise. The work on this axis will serve as foundations for work on the other two axes. Thus, this axis will have the strongest impact on our goals overall. The second axis tackles another aspect of knowledge discovery in data: the interaction between the user and the system in order to co-discover novel knowledge. Our team has plenty of experience collaborating with domain experts, and is therefore aware of the need to improve such interaction. The third axis concerns decision support. With the help of methods from the two previous axes, our goal here is to design systems that can either assist humans with making decisions, or make relevant decisions in situations where extremely fast reaction is required. The following figure sums up the detailed work presented in the next few pages: we show the three research axes of the team (X-axis) on the left and our main applications areas (Y-axis) below. In the middle there are colored squares that represent the precise research topics of the team aligned with their axis and main application area. These research topics will be described in this section. 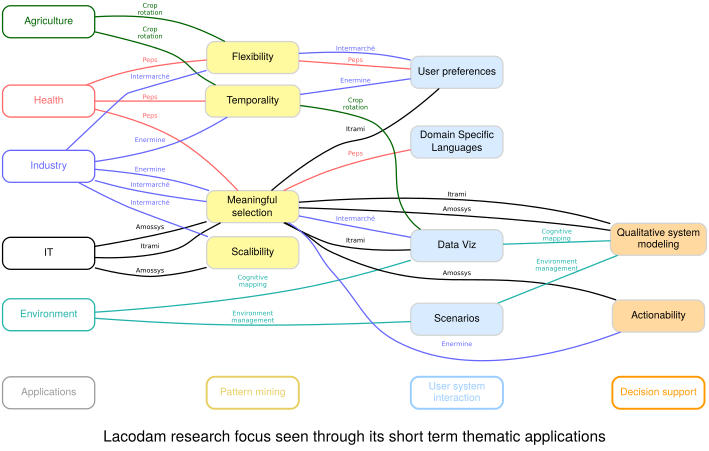 Lines represent projects that can link several topics, and that are also connected to their main application area.